It’s November. Did you know that? I kinda knew that but it didn’t sink in until about two hours ago. It’s 2am. I’m up. I went to bed at 10pm after we caught up on Homeland (Carrie is off her meds and its super fun!) About an hour later I woke up and haven’t been able to sleep. My mind is reeling. October is over. But it feels like late September. It’s sunny and not too cool (actually right now it’s pitch black and nippy out but you get my point). 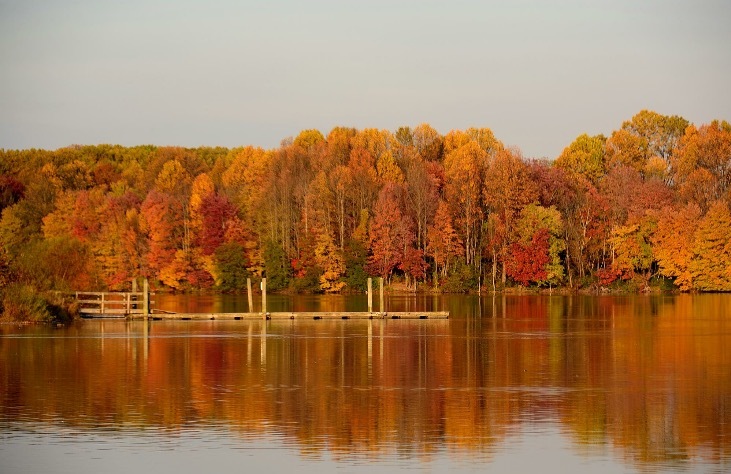 The Fall foliage is in Technicolor – no filters needed. I can’t believe I’m talking about foliage at 2am. Correction – 2:10am. We kicked-off college visits with my baby girl and I’m sad/happy/excited/scared/jealous/weepy for her. Who will be my partner in crime for all foods ethnic? Definitely not her father and brother, their idea of ethnic food is salsa. Who will tell me about cool new music and make me feel like I’m in the know? I know what you’re thinking. All these things are about me. But she’s about me. She’s mine. I’m not ready to let the world have her yet. The world isn’t good enough. I wish she could experience all those amazing things that are around the corner for her, but still come home every night and sleep in her bed. So now I cry randomly when I’m alone thinking about dropping her off at school. Good times. I’m obsessed with Project Greenlight. Matt Damon and Ben Affleck were supposed to be the most interesting thing about this show – and yet they are the least. Effy, the valley-girl-dreadlocked-feminist producer who lives to drive newbie director Jason crazy with her control issues is what’s interesting. The fact that Jason looks like a real life version of Jack Skellington from A Nightmare Before Christmas is just a bonus. Watch it watch it!! Babes with Books is still going strong! In fact, it’s my turn to host book club next week and I’m excited to see the ladies. We picked Me Before You. Have you read it? Did you love it? I read it in one day. Couldn’t put it down. It could have been a predictable story but it wasn’t – even the parts that you can predict are slightly twisted. Read it read it!! 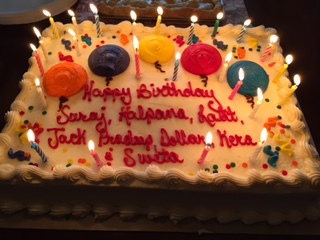 We hosted 8 birthdays in one day. 8. Birthdays. Efficient and crazy. That’s how we roll. See birthday cake as proof! My baby boy was one of those birthdays. He’s 12 now. 12 years ago I woke up at 4am and hightailed it up to Vassar Brother’s Hospital in Poughkeepsie, NY. 12 years ago I brought home this little, strong-willed, creative, smart, kind boy who makes me laugh every day (when he’s not driving me crazy). 12 years flew by like 12 minutes. 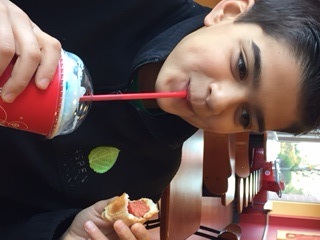 See his picture below – at 9am, eating a hot dog and drinking an Icee on what he called his “cheat day”. I don’t even know what that means. But I’ll play along. Forever. 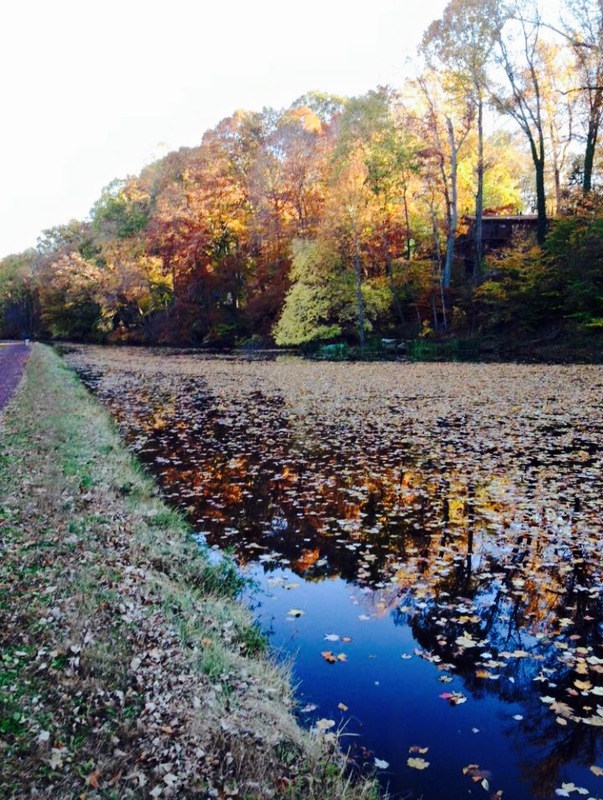 Fall in our town is my jam. One of our very good friends is a gifted photographer and generously shares amazing shots. Marcello you are the best! I posted some of my favorites below. So….Halloween down. 8 birthdays down. 1st college visit down. Bring on November! Or continue on with November! Everything is connected. All the time. Don’t you think? Let me explain. My husband and I snuck off to see the movie Wild on Friday night. 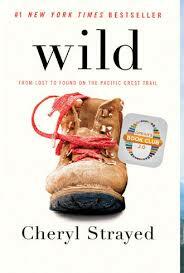 It was the first book I read when I joined my book club a few years ago. Great book. Great movie. Great book club. But this isn’t about the movie or the book club. This is about the soundtrack to the movie. I need to back up a few years. In 2010 my husband turned the big 4-0. He only wanted one thing to celebrate – a trip to Munich, Germany for Octoberfest. Turned out that 2010 was a celebratory year for that event (I can’t remember if it was 150 years or 100 years). Either way it was a big year for them too. So we went, and it was a blast. Him and I are really good travel companions (not in an Amazing Race kind of way, but in a relaxed House Hunters International kind of way). We stayed about a mile from the fairgrounds and headed there the first night we arrived. It was out of control and amazing. Crowded. Loud. Did I mention crowded? Our favorite haus introduced us to all kinds of characters (we were almost lured into a tricky situation but that’s another story). We had a blast. A couple of notes for those who have never been. There are a lot of Italians there. A lot. Molto. Also, John Denver is their God. Everywhere you go – in every tent – every 5 minutes – they play Take me home, country roads. The entire place stops and all the Italians and all the brauhaus servers sing along holding hands. True story. I’m off the rails. Back to why everything is connected. By the third night we were pretty much done with all the fest fun. My husband suggested we find a small, local pub off the beaten track and spend the evening there instead. And because he has a tracking device for such places, we found one on the other side of town. Quiet. Small. Almost empty. Dark. Perfect. We settled in with our beers, ordered some food and chatted with the two other people in there. Did you know Germans are very friendly? Did you know Germans in a bar with beers are even friendlier? They are. After about an hour of hanging out there, the doors to the pub flew open and an entire oompah band walked in. 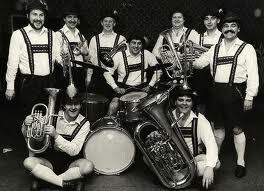 Have you ever seen an oompah band? Sorry I’m asking so many questions. Oompah bands aren’t petite. Here’s what they kinda looked liked. Imagine this group with those instruments walking into a small, dark, pub – you notice. Turns out that the oompah band are regulars here. And they don’t just put their instruments down and relax, oh no. They play. They play loud. By the time they got there, we were ready for some excitement and my husband started hooting and hollering as he often does and recording them with his phone. We bought them beers. We sang along. It was great fun. At the end of the night they played Simon and Garfunkel’s El Condor Pasa. My husband leaped out of his seat and started yelling and screaming. What can I say? He likes Simon and Garfunkel – and we were so happy not to be hearing John Denver. They played really well and I thought I knew the song but couldn’t remember. My husband turned to me and said,” you know, I’d rather be a hammer than the nail…yes I would, yes I would.” I nodded and smiled. Oh yeah, I said, sure I remember. Truthfully I had no idea. Days after we got home from the trip we would play that song and even John Denver to remind us of the trip. We even made the kids listen, showed them all the videos. Eventually the videos got deleted, because unless our kids in them – they really don’t seem to make the cut. A few months after the trip we were still thinking/talking/singing about our time away. My husband decided to Youtube videos of Octoberfest one night – that’s how desperate we were to relive our time. He watched videos of all the differnt brauhaus fun. Then he typed in El Candor Pasa Oompah band. And the first video that popped up was the one he clicked. He turned it up. It ended. He watched it again. Turned it up louder. It was a dark video of an oompah band playing the song in a small pub. No way. He called me over. He said, “do you recognize this?” He played the video and it looked kind of familiar – but it was so dark, I couldn’t make it out. Then he turned it up and pointed to the corner of the room – where there was a dude recording a video of the band and hooting and hollering. NO!! It couldn’t be!! But it was. Someone else from that bar had recorded the band too – and in the background was my husband holding up a phone and yelling. You couldn’t really make out his face, it was blurry – but it was him! Come on!! That’s fantastical no? I feel my kids rolling their eyes somewhere out there in the universe. We’ve told them the story a few million times. It’s a good story. Ok I’m getting excited again. Back to the movie. Told you it wasn’t really a review. The soundtrack is amazing. It’s the one thing that kept my husband awake the whole time. And I know he liked the movie, even though he kept tapping me and asking,” when does it get WILD?” every few minutes. He’s hysterical. I’ll ask one last question. What song do you think they played all throughout the movie? Yep. That’s the one. Everything is connected, even if it involves oompah bands and book clubs. Racism. The old fashioned kind. I went to get a book for my friend’s son (a boy so beautiful he would blow up the blogosphere – but alas, his smart mama keeps him off the interweb). I try to get a book he will like and his parents won’t hate reading 1,000 times to him. 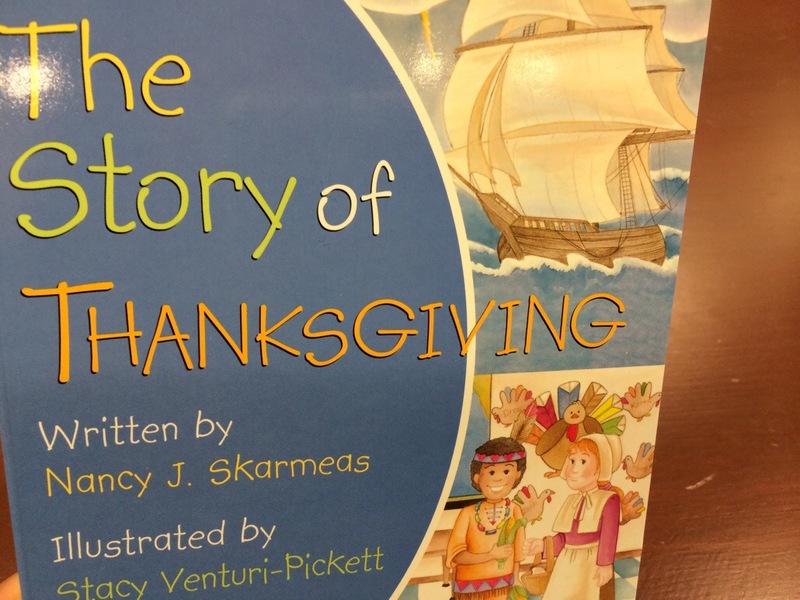 As I was perusing, I found this Thanksgiving book. I was drawn to it right away. Because of the way it was drawn. 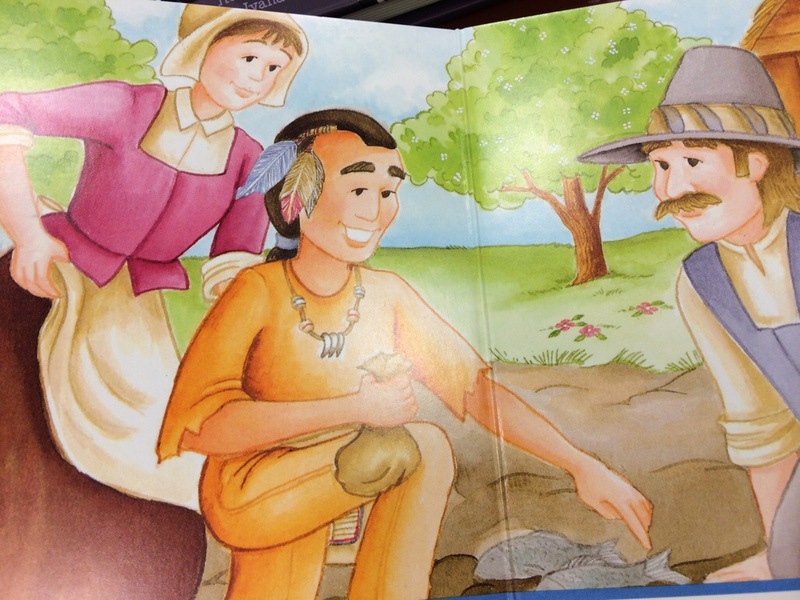 None of that cultural sensitivity stuff from the newer books. Just good old fashioned stereotyping. I grew up in the 70s and 80s. Everything that we called normal is now called hazing, bullying, sexual harassment, ADHD, cultural insensitivity and it’s evil twin – racism. 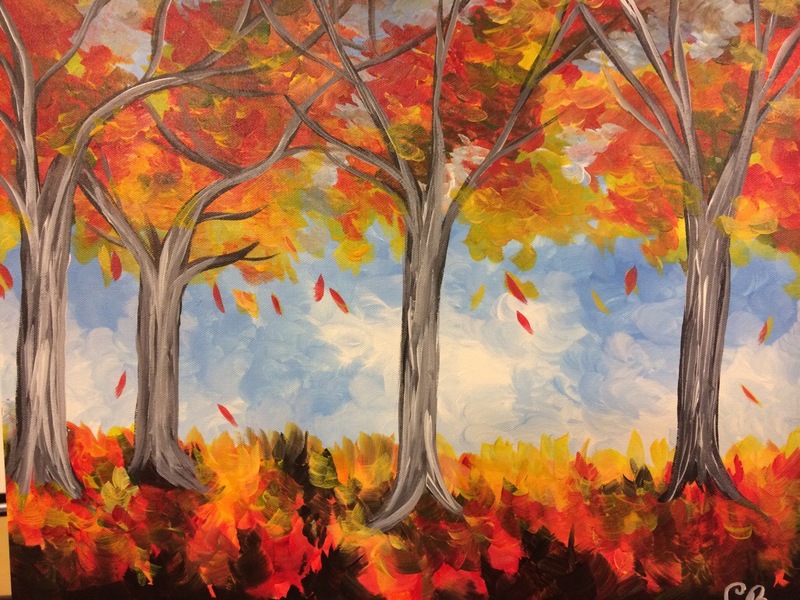 Many 40+ olds like me are now in therapy or spending quality time in a bar reflecting and learning why none of that was normal. And it wasn’t normal or right. We were just too busy wearing shoulder pads to notice. That’s why I was so surprised to see this book, published pretty recently. Look at these old school images. 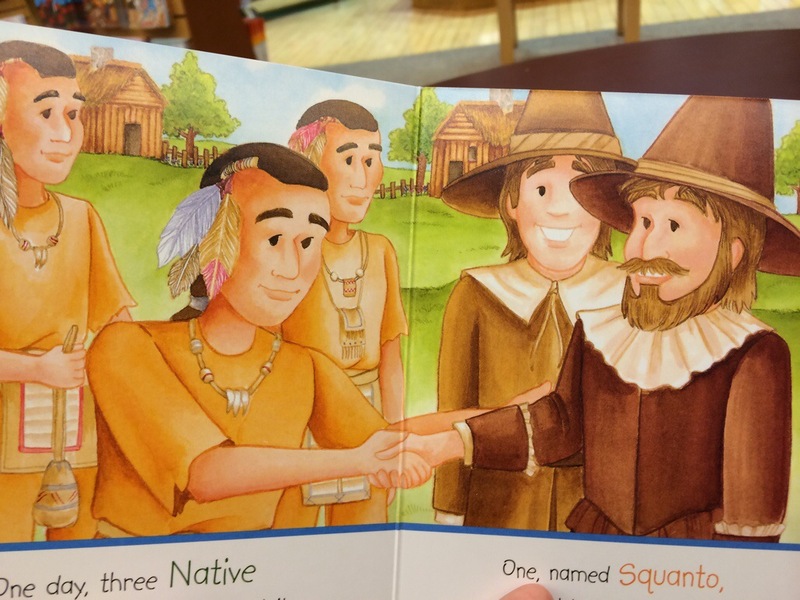 Squanto and his pals actually have feathers on their heads – and mohawks – you know, cause their Injuns (which I now know is an offensive epithet and not a cute abbreviation. See, all that time at the bar helped). I’m obsessed with these pics. 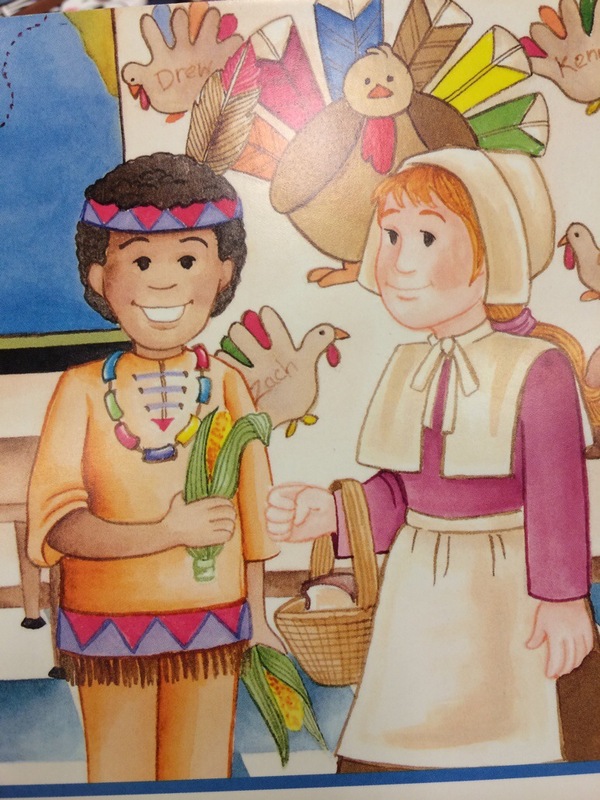 I can’t figure out why one of the pilgrims has a groovy Afro or why some of the pilgrims have hipster mustaches. The picture below brings me right back to elementary school. I’ve seen a version of this pic a million times. 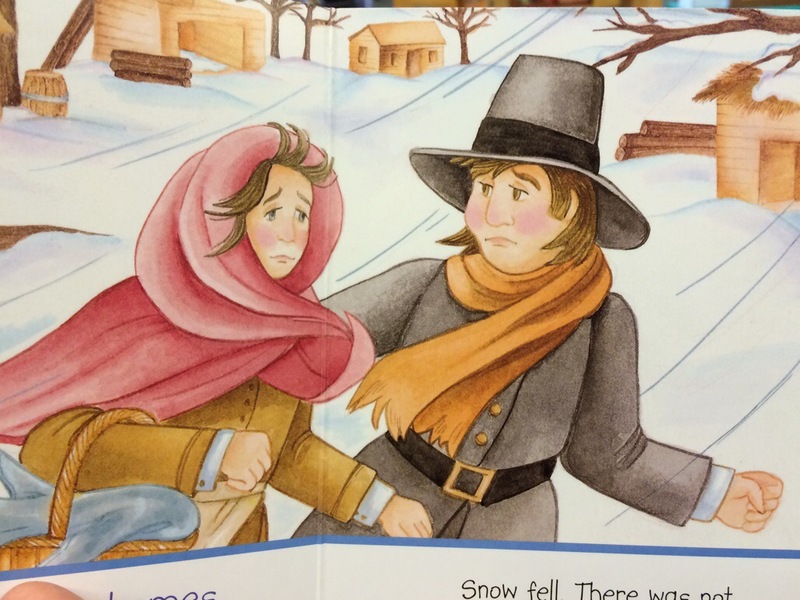 The pilgrims facing the cold, hard winter. Why don’t they just go into the warm wood cabins behind them? Duh. I should have been a pilgrim. 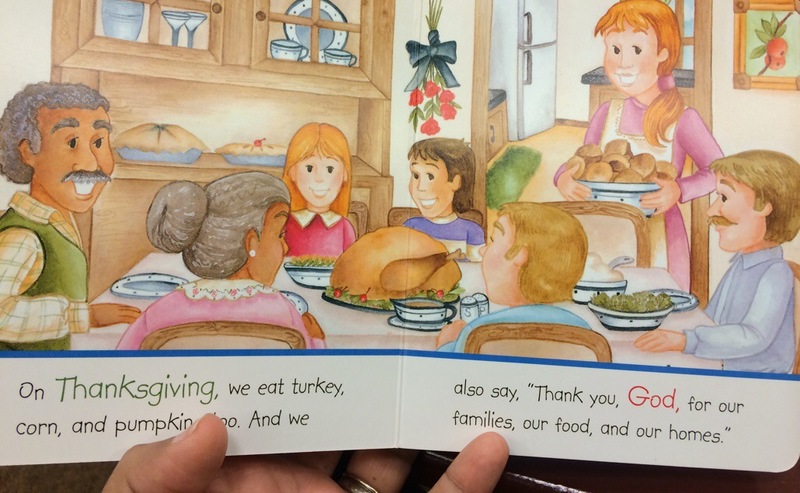 Once they explain the “origins” of Thanksgiving, there’s a picture of a modern family enjoying the feast. I’m digging the addition of the African American grandparents – but where are the descendants of Squanto? Atleast 3 culturally insensitive jokes come to mind. I won’t write them. Cause I know what cultural insensitivity feels like, I’m an Injun too. Dot, not feather. We finally had another book club meeting tonight. It’s been a long, bookless summer. Because why would I read a book if I’m not getting credit for it? Duh. We read Let’s Pretend This Never Happened by Jenny Lawson. If you read my post yesterday you’d know that I straight up crammed the book in about 24 hrs. I’m so happy I did. It was LOL funny. How can you not love a book that waxes poetic about taxidermy, miscarriages, and blogging. You don’t think they belong together, but they do. Did I mention that the author curses more than a truck driver? (And can we change that expression? I’ve never heard a truck driver swear. Maybe it should be “she swears more than the Kardashians). 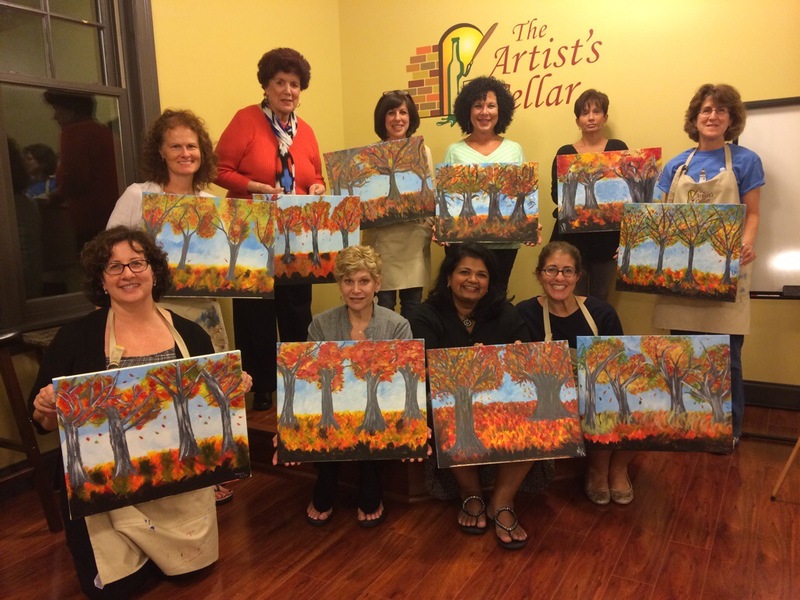 Instead of meeting at a member’s house, we were invited to The Artist’s Cellar. You’ve seen these right? 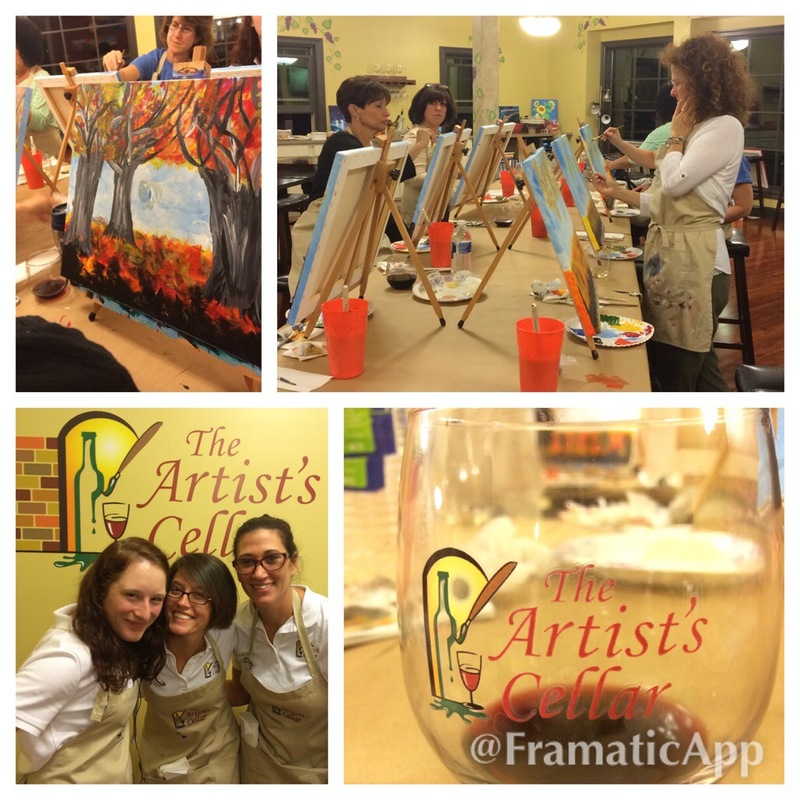 You wine, you paint, it’s all good. We had a blast. Babes with Books (BWB) rocked it. Here’s me and the beautiful woman who created BWB (I think. I mean I KNOW she’s beautiful but I’m guessing about the other part). We took a selfie. It was her idea. Or mine. We had adorable instructors named Cayla, Cameo and Jessica and the place was awesome. 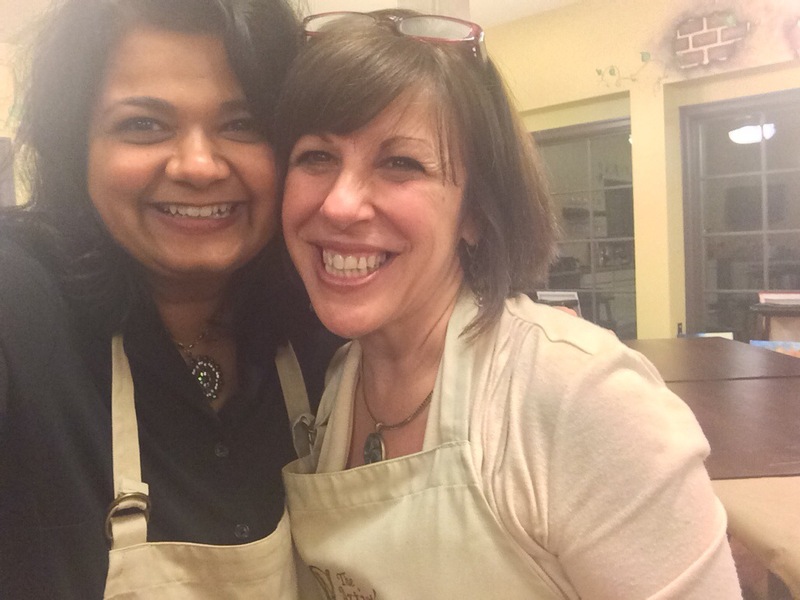 Booze, loud gals and detailed instructions – what could go wrong?! 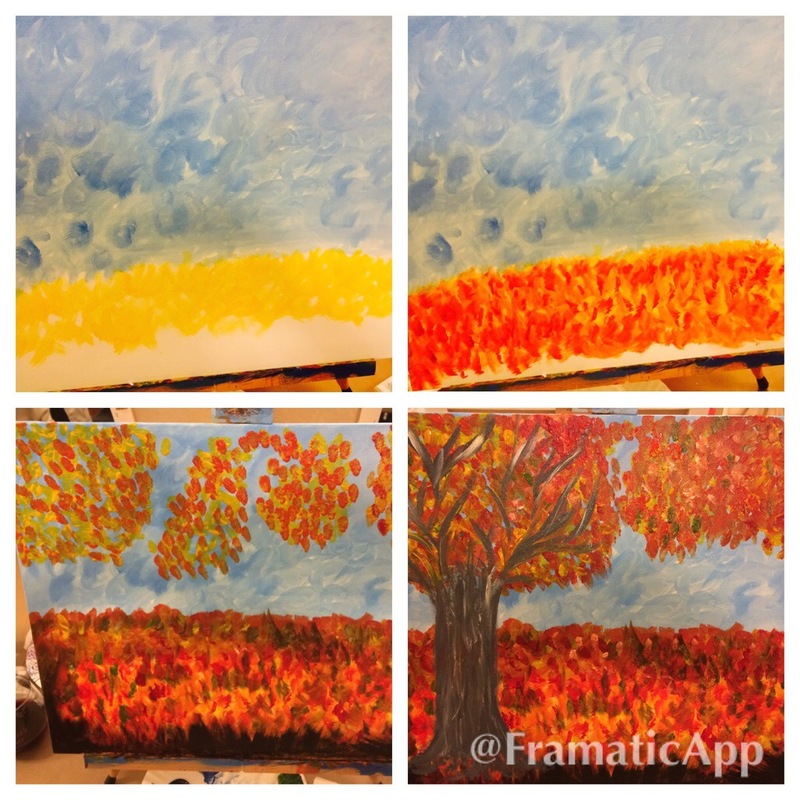 Here’s my masterpiece in the making. 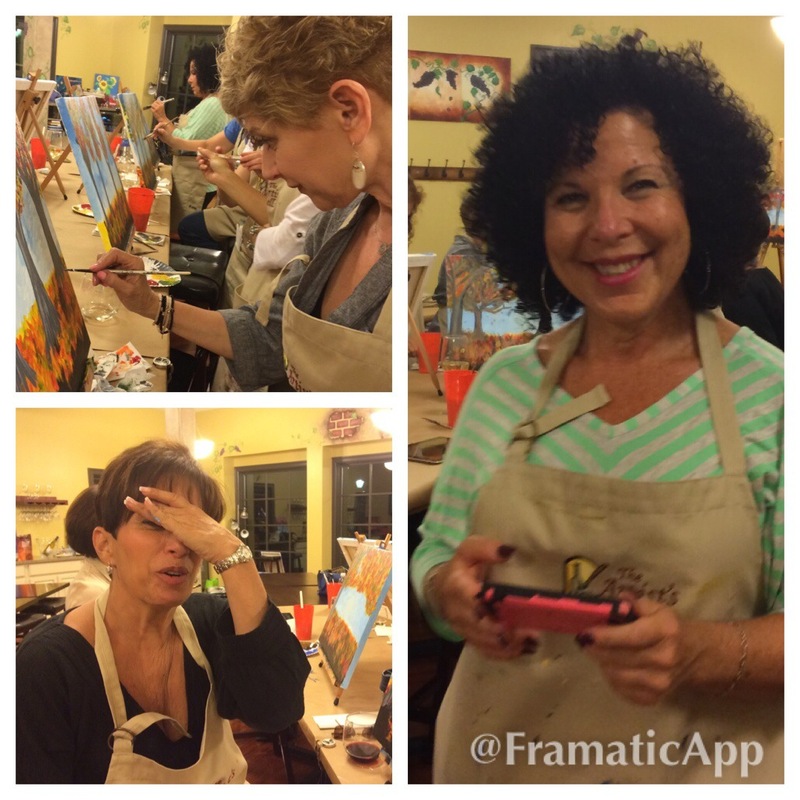 As always with this group, we talked about the book…oh…for a hot second. And then we talked about psychics, grandkids, medication and other miscellaneous items of urgency. A good time was had by all. You don’t see four trees you say? That’s called creative license! 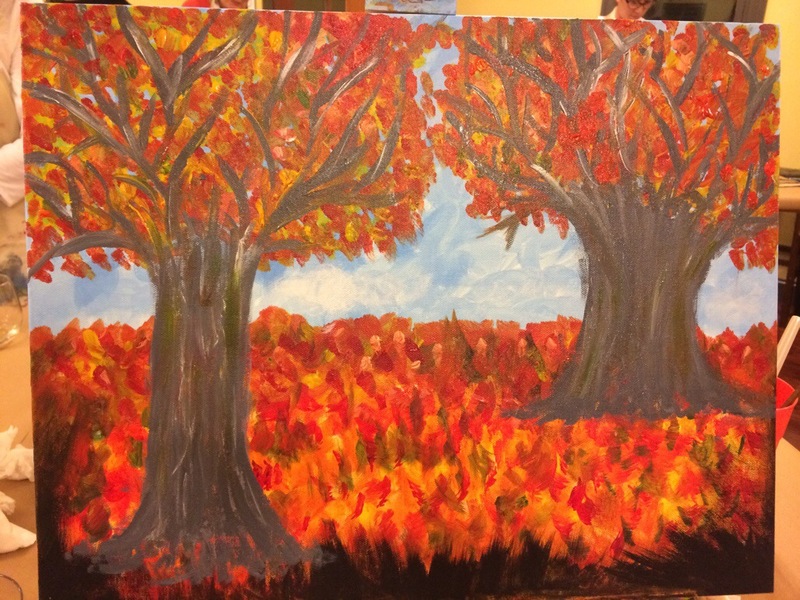 It doesn’t have anything to do with four trees merging into two blobs that I had to make into trees. Stop judging me. And here’s some pictures I took while I should have been painting. One of my best gal pals has been telling me to watch this show for a long long time now. But I wasn’t interested because her taste in pop culture is….how do I put this…non existent. She watches minimal TV and when she does, it isn’t on Bravo. Sometimes I have to explain the cover of US Weekly to her, just sayin’. So this past week I was on a plane or at an airport for approximately 12 hours of my life…perfect binge watching environment. I gave the show a shot because frankly I’ve seen everything else (except Lost. Can’t go there). She was right. The show is fantastic! Move over Olivia Pope, make room for understated acting and writing. The show had me at Christine Baranski – and I haven’t even gotten to the Alan Cummings season. I hope Huma Abedin, Silda Spitzer and Jenny Sanford all watch this together. As you all know, after the holidaze my husband and I hibernate until Easter. There’s the odd get together here or there, but in general, we work and we stay home. Or go to a movie. This year we had a lot of good choices. We’ve seen almost all the ones that have been nominated – but my favorite so far is this little movie. Simple and complex, quiet and devastating. You don’t need any 3D glasses to feel like you are a part of this story. A man stranded alone on a boat after an unfortunate accident. There are a few voice over lines in the beginning – and a couple of words in between. Other than that there is silence and isolation. It’s like Castaway without Wilson or a neat, happy ending. When I was little, my mother was obsessed with the cooking shows she found on TV – mostly on PBS. Paul Prudhomme, Julia Child, Martin Yan, these were the faces in our living room. She would never make a perfect roast chicken and I’m pretty sure she still hasn’t tried Chinese food – but she couldn’t get enough of those shows. I remember very clearly how happy she was when The Food Network started. To this day it’s her goto channel. Like a true mother’s daughter, I’m just as obsessed. This book isn’t about the celebrity chef drama – there’s no mention of downfalls or scandals. This is how and why the network got started. If you get off on back-of-house info like I do, this book is for you.